An Opulent Feast of Modern Cantonese! My MIGF journey continues to the exclusive and elegant Lai Po Heen at Mandarin Oriental Kuala Lumpur. 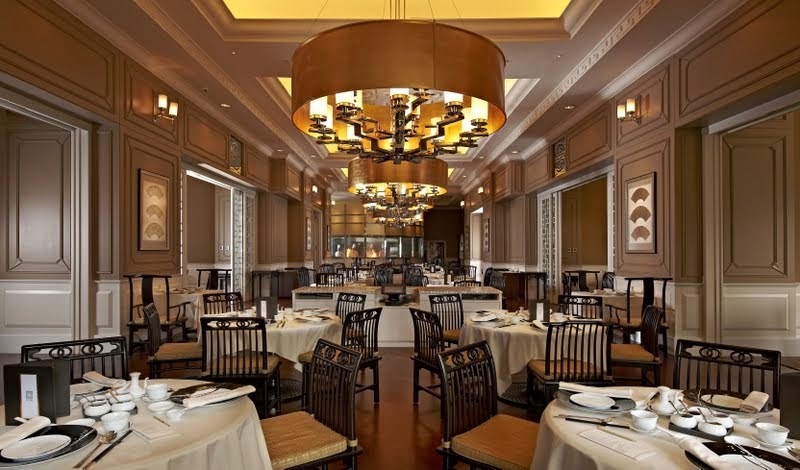 Helmed by multi-award winning Chef Ricky Thein, gourmands are treated to a luscious interpretation of modern Cantonese cuisine set against elegant and opulence ambience of Lai Po Heen. Chef Ricky Thein pays tribute to this year’s MIGF theme of "Cool Chefs: Cooking with Attitude!" with his own cool set of menu. Participating consecutively for the fifth year, this veteran is constantly thinking out of the box to showcase his repertoire of modern Cantonese dishes from his experience and journeys around the world. Chef Ricky, a creative and yet humble chef, plays with gems of the sea and a luscious meat in this year’s menu. Every point from the highest quality ingredients to the sleek presentation is set to impress any gourmands. An unpredictable appetizer, our appetite is already in gear as soon as the dish was cleverly presented in a deft defying gravity glass balanced on bamboo. Snuggled in the glass is a large scallop from Hokkaido marinated before being smoked and chilled. Based on a honey sauce, the scallop has a tender and firm texture of smoky sweetness. A medley of organic greens with pretty edible flowers and Spanish baby cherry tomatoes concluded the dish in textures and flavors. Simply unique and creative! Soups are definitely Chef Ricky’s forte. This year, a pleasurable healthy soup double boiled for hours serves as the base for this course. Using dried Mingmu, the soup is said to improve one’s eyesight while the ginseng helps to boost immune system and lower blood sugar. There are also black chicken, fresh fish maw, dried scallop and baby cabbage in the soulful soup. The soup itself has a full body essence of the sea and land from all the ingredients. After completing this course, one can literally feel at ease and sigh with comfort at this luxurious soup. Going one step further into lavishness, this course features a whole Australian abalone braised in superior oyster sauce crowned with a perfectly poached quail egg. The dish, a shimmering rich golden pool of sauce, has cauliflower florets and tobiko added to accompany the lavish mollusk. As one sliced into the abalone, one can feel the tenderness of the well braised abalone. Savory with a hint of sweetness, the dish is subtly refine and so well controlled in flavors. An exquisite dish with a modern twist! 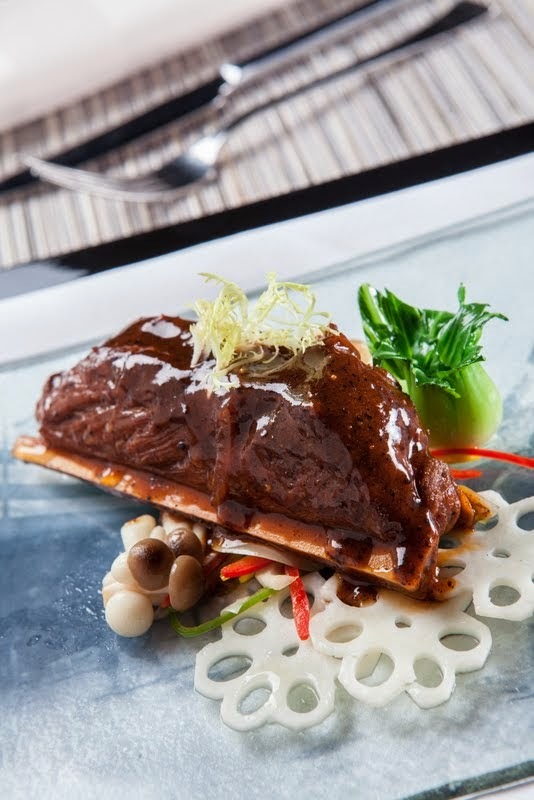 The main dish represents the land in the highest quality of angus beef ribs braised till soft and laced with black pepper sauce. It is paired with lotus root, shimeji mushroom and baby cabbage. It is a truly exquisite menu that one cannot help but to be impressed by the skill of Chef Ricky Thein. The clever combination of the land and sea is taken to new heights with the modern interpretation of Cantonese cuisine. 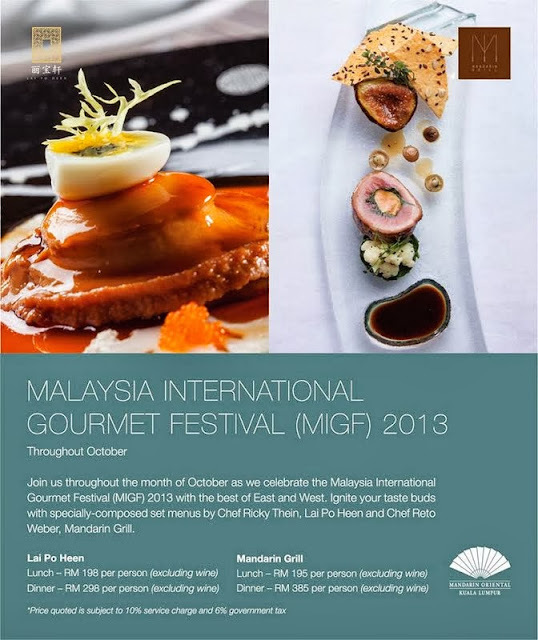 For the whole month of October, Chef Ricky’ MIGF menu is available for lunch and dinner at Lai Po Heen. The food here is always so pretty. Have not tasted Abalone for years ! Gosh, I wish ! so tempting ! oh my the abalone looks great!